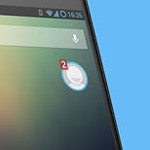 Paranoid Android made headlines last week when it announced a new take on mutitasking called Halo. While the feature wasn't available for user testing at the time, the team has now pushed out early alpha builds for the Nexus 4, Nexus 7, Nexus 7 3G, GSM Galaxy Nexus, and Oppo Find 5. This is still a "very early build" of the ROM, so expect bugs, crashes, and other odd side-effects that come along with using alpha software; in other words, don't expect to use this as a daily driver. Still, the PA team claims to be about halfway through its Halo implementation, as it has broken integration into three phases: rewriting the framework, getting Halo performing its basic functions, and allowing notification-switching directly through the Halo interface. The first phase has been completed at this point, and the second phase is said to be halfway finished. Once that's complete, the third phase will begin. If you'd like to give Halo a try in its current state, head over to Paranoid Android's Google+ posting for build and GApp downloads. Update: The PA team provided this handy FAQ.